Ever since Dragon Ball Z presented the idea of Namekians fusing via Piccolo and Nail and later with Piccolo and Kami, fans have wondered how powerful a Namekian could get if a group of them fused together. Dragon Ball Super finally brought that reality to life during the "Tournament of Power" arc with Universe 6's Pirina and Saonel, and the latest chapter of the manga gave the Universe 7 Namekians the same treatment. After easily defeating both Goku and Vegeta with his energy absorption technique, Moro continued terrorizing Namekian villages in order to take their Dragon Balls. The two Sayians were revived by the Namekian Eska and were back on their feet just in time to see Moro attack a nearby village. One of the elder Namekians then revealed that the planet had resorted to using the same assimilation technique used by Piccolo and Nail to combine their strongest warriors into one fighters. The manga showed three Namekians fuse as they flew towards the village of Tsubari, with an elder introducing the nameless lone fighter. 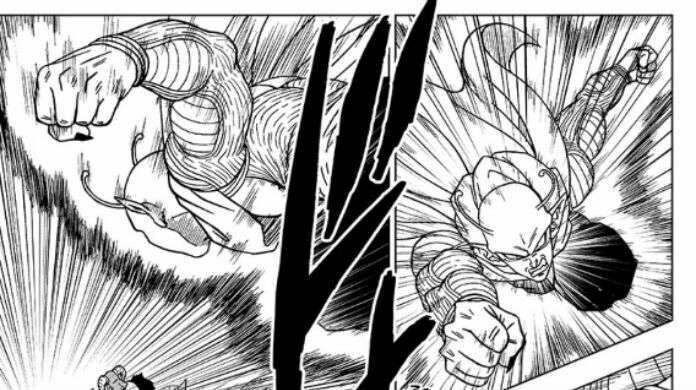 Unfortunately the Super Namekian had little chance against the high-powered goat wizard, as Moro killed him by jamming his arm through Tsubari's chest without even looking at him. "Was this your savior, by chance?" Moro said with an evil smirk. "Apologies. He was dead before I could even see his face." The chapter concluded with the graphic killing, setting up Moro to attack more villagers. As the main villain of the "Galactic Patrol Prisoner" arc, Moro first grew to power in Universe 7 10 million years before the current Dragon Ball time period. He was originally defeated by Daikaioh (who was later absorbed by Majin Buu) and arrested by the Galactic Patrol, but nobody was strong enough to kill him once he was sentenced to death. Goku and Vegeta took their first crack at beating him when they first arrived on Namek as part of the Galactic Patrol, but were no match once he had absorbed enough energy. Dragon Ball Super currently airs its English dub on Adult Swim during the Toonami programming block Saturday nights. It is also available to stream on Funimation and Amazon Video. The Japanese language release of the series is complete, and available to stream on FunimationNOW and Crunchyroll. The manga has chapters that can currently be read for free thanks to Viz Media.